This makes me sad. The French have been very proactive in encouraging communities with English immigrants to have a voice by electing someone to stand on their local council. 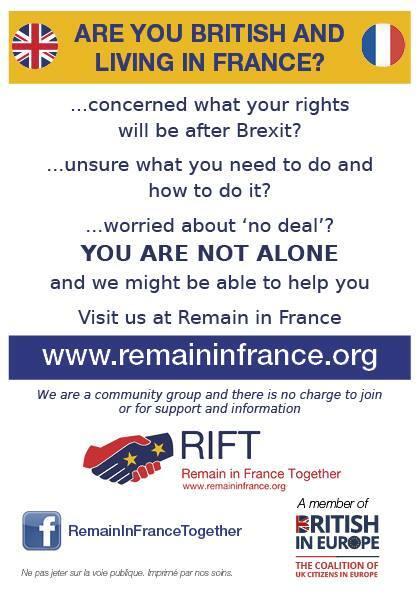 They want us to do our bit, get involved, have our say, help out in our French community, but also to have a representative on hand to help out our fellow immigrants. I have been called down to the Mairie many times since the 2014 elections to help someone newer to the village who has a problem and may not have the language skills to understand what to do now. The EU referendum vote in the UK will not mean that my village will chuck me out or stop me from volunteering or helping in the local community, but it will take away my voice. Immigrants are often criticised for arriving and not integrating in their new communities. My right to integrate as I am doing now, as a village councillor, is in jeopardy and once the UK has exited the EU, will be lost. Democracy exists to enable change to happen and that must be viewed as a good thing. At present no one can be certain what these changes will mean for the future of the UK or Europe and I only hope that positive things emerge. The only certain is that things will not remain the same and my daily rights to live my life as I am doing now will be effected. There will be challenging and worrying times ahead, but whatever happens and wherever I end up living, I know that this quirky little village in the middle of rural France has felt more like home to me than anywhere else I have ever lived. 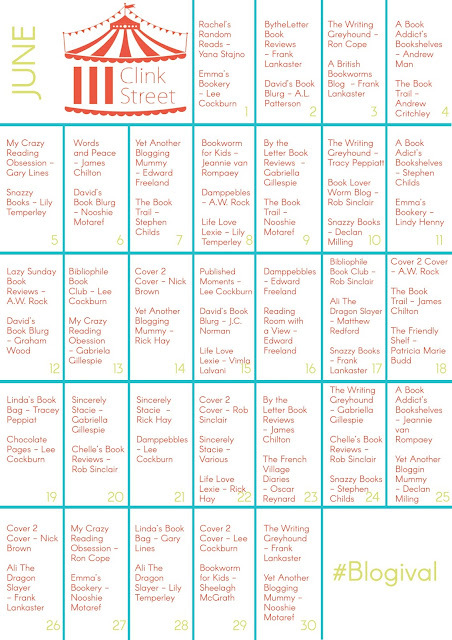 Today I am taking part in the Clink Street Publishing #Blogival Book Tour with a review of A Clean Pair of Hands by Oscar Raynard. This book starts with a mysterious break-in at a wealthy residence in the outskirts of Paris. The motive seems odd, what is reported to the police doesn’t seem to fit the evidence found and I really wanted to know what had happened and why. The back-story then begins, introducing the victims, their lives and their business dealings. So far, so good and I was looking forward to revelations, skeletons and possible deceit. However, it then became rather political, which I was expecting to a certain degree for a novel claiming to highlight the corruption of the French system, but when the main character Michel, who I was hoping to be an exciting rogue, began droning on and on and self-analysing, I soon lost interest and found some sections quite slow to read. Thankfully the story unravels in a very roundabout way, replaying conversations, business meetings and family gatherings from the past, all with an undercurrent of distrust in Michel, that I was drawn in, especially by the snippets of family life. This ensured I was keen to continue reading and discover just what had gone on. Michel is certainly a man who seeks pleasure, but as his need for thrills increases so does the risks he has to take and although he is clear in his mind about his methods, the author doesn’t forget that in life there are always consequences that must be faced too. 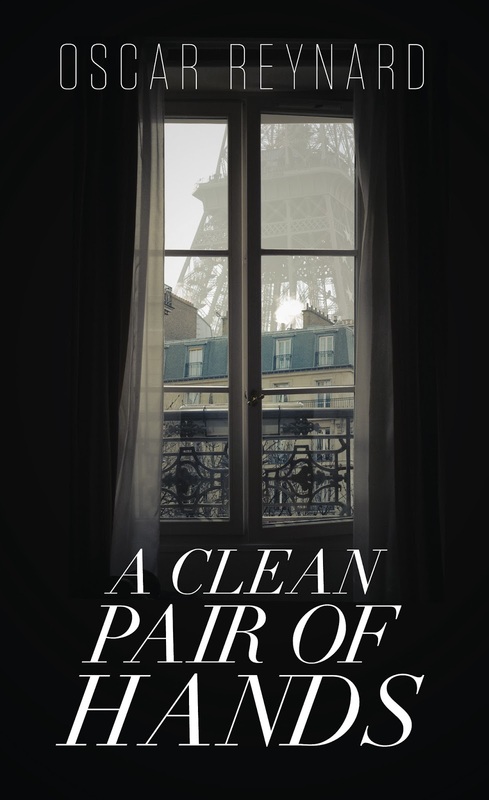 A Clean Pair of Hands is published by Clink Street Publishing and is available in paperback and ebook versions. Links to Amazon can be found below. To see other stops on the tour, check out the calendar below. The first day of our Ardeche adventure began with a 5.30am alarm, just as dawn was breaking and by 6.30am we were on the road. Unlike the steely grey sky of the day before, with downpours that flooded the terrace, the wispy clouds looked far more promising for some better weather. As our journey east progressed, the sun made an appearance and slowly but surely the temperature crept up from 14 degrees to 20. We passed a fox tucking into a breakfast of fresh roadkill, then drove through lamb country in the Haute Vienne and cow country in the Allier department of the Auvergne before stopping for a morning coffee, in the sun, in Montluçon. Before lunch we were on the A71 heading south and the countryside was suddenly much hillier with the volcanos of the Auvergne and Puy du Dôme looming on the horizon. By lunchtime the temperature had reached an almost tropical 22 degrees, not usually something to shout about in France in June, but this year any day with patches of blue sky and a temperature over 20 is worth an outdoor apero in celebration. We picnicked at a roadside aire where the toilets were clean and there were lots of tables, all thoughtfully placed in the shade of the trees, although it would have been lovely to have sat in the sun. At 12.00 on the dot, most tables had been snapped up and were laid with tablecloths and napkins and groaning under the weight of cool boxes and large food hampers. The French know how to picnic, even if it is just a roadside lunch. Our slice of homemade quiche (that I had got up at 6.30 on Thursday morning to make) followed by a natural yoghurt each, looked out of place and rather inadequate, yet again. The road from St Etienne was a slow and steady climb with hairpin bends and feathered pine trees towering above us. When the road became a col (mountain pass) and the houses had steep pitched roofs, the temperature dropped to 15 degrees, but the scenery was beautiful. The traffic was busy, going the other way thankfully, as St Etienne was hosting a Euro2016 football game between Croatia and the Czech Republic later in the day. We weren't tempted to hang around as we had a Vélo village in the Ardeche waiting for us to visit. We slowly descended to the Rhône and soon found ourselves driving through cherry and apricot orchards, laden with ripening fruit and vineyards scaling the steep embankments. We seemed to have left behind the rain we found in the hills, for a while at least and the warmth of the sun felt very welcome. The Rhône in Tournon is very wide, fast flowing and full of logs and other dark, unknown debris rushing downstream. It isn't a friendly meandering river here and from the flat road at the bottom of the valley, the steep hills on either side also looked quite scary and rather menacing. We will be cycling in these hills very soon. We arrived at the cardiology clinic, a clean and bright ground floor unit in a residential part of town, to be greeted by Sophie, a chatty nurse with a lovely smile. There was no need to sit in the waiting room, she took us directly through to a consulting room and wasted no time in getting Adrian onto the bed and hooked up to the first set of machines. With clips on his ankles, wrists and wires on his chest he was told to lie back and not move, even his head. The doctor arrived, introduced himself, looked at Adrian’s notes and quietly watched the test results on his computer screen. This test was followed by an ultrasound scan of his heart and arteries while I watched on as images were frozen on screen and measurements were taken, and none of it made any sense to me. It could have been very scary, seeing Adrian hooked up to machines and hearing his heartbeat amplified on the scanner. However it was just another example of French health efficiency and after twenty minutes we were on our way with a clean bill of health for Adrian’s heart. To do any sport in France it is normal to need a medical certificate from your doctor, so with Adrian’s Ardechoise sportive and his Ride London Surrey 100 coming up we thought we ought to see our doctor, even though we discovered afterwards that the option he has chosen to ride in the Ardechoise isn’t classified as an event needing a cycling licence or medical certificate to take part. Our doctor, delighted to have a rare visit from Adrian, went to town checking him over and ordered a complete set of glucose and cholesterol bloods, that all came back normal. However, as his Dad has had heart issues and his Grandfather died in his forties, from a heart attack, our doctor wanted him to see a cardiologist, just to be safe. It is certainly nice to know that everything is working as it should and the cardiologist has no worries about him pedalling away on his bike. To celebrate he achieved his first Strava King of the Mountains listing on a short hill section in the Charente Maritime – Go Adrian! 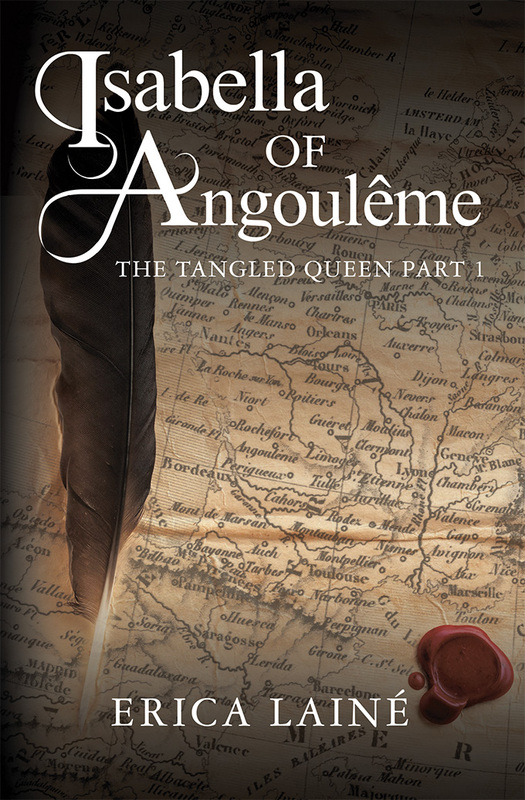 An excerpt from Isabella of Angoulême: The Tangled Queen Part 1 can be found at the end of this post. This novel is set in the early 1200’s when power, corruption and the need to marry well, to ensure the continued allegiances between powerful and corrupt families, were commonplace. It was not unusual for brides to be children, often promised to much older men from a very young age. Isabella was one such bride, promised to Hugh Le Brun, Count of Lusignan, and she was sent with her maid to live with the Lusignan family and await her marriage. Here she met the notorious King John, who wanted her for his bride and her father, being more concerned with the family name than his daughter, helped to abduct her and had no qualms at marrying her and sending her off to England at 12 years of age. The demands made on her by her husband meant her life, as Queen of England was often lonely, frustrating and difficult. She provided John with five children before his death in 1216, when she had little option than to return to France as Countess of Angoulême. Despite never having heard of Isabella, I was intrigued by this book as not only is Angoulême about half an hour from where I live, but a recent holiday to Le Mans had sown a seed of interest in the Plantagenet history period and I was keen to learn more about the this royal family, whose kingdoms crossed borders between England and France for many generations. Many places mentioned in England were recognisable to me from my childhood and I even remembered learning about some of the events that appeared in the book, like the signing of the Magna Carta in Runneymede. I have also visited many of the places mentioned in France (usually on my bike rather than on horseback like in the book), including Angoulême, Lusignan in the Vienne and L’Abbaye de l’Epau in Le Mans. They all played their part in Isabella’s story and this book helped me to piece together the shared English and French history. Having only recently become interested in this period, I was a little concerned that I might find it to be too much like a school history lesson, but I need not have worried as from the beginning Erica easily kept my interest by adding personality to the characters while retaining the historical facts. As a British immigrant holding court in France (well I’m on the village council) at a time when Europe is going through turbulent times, this book has made me realise this is nothing new; similar problems have been happening for centuries and will likely continue to do so. I was born in 1943 in Southampton and originally studied for the theatre. I moved with my family to Hong Kong in 1977 and worked and lived there for 20 years, writing English language textbooks for Chinese primary schools and managing large educational projects for the British Council. 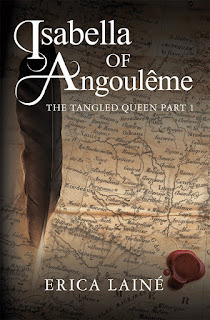 Click on the Rafflecopter link below to enter the giveaway where two ebook copies of Isabella of Angouleme can be won. Good luck! This time next week we will be off on our bikes again exploring the craggy terrain of the Ardeche, an area we first visited in September 1998 as a young married couple, a mere five months after our wedding. 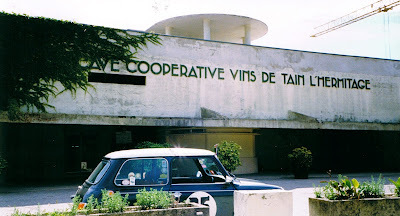 We didn't even own bikes then, but have fond memories of the week we spent in a rural gite in St Julien Labrousse and of touring the area in Gizmo, our Mini Cooper that we still own and enjoy road trips in France with. Looking through our photo albums (remember them) we look young, we have no grey hairs, but if I’m honest we are probably fitter now than we were then. It would be many years later when Adrian would reignite his love of road bikes and I would discover a love of cycling, but our love of France and especially rural France was already there. We are really looking forward to returning, re-living a piece of our youth and rediscovering this area with our bikes. On Saturday Adrian will be taking part in the Ardéchoise, which will be the biggest organised cycle event he has so far taken part in. The small town of St Félicien will host over 16,000 cyclists for this four-day event that is now in its 25th year. With courses for adolescents, cyclo-tourists and sportives there is something for all levels. Course profile of Le Doux - look at those hills! Adrian has signed up for Le Doux an 85km route around Le Doux valley that climbs 1,525m on hills that will be far more challenging than anything we find here in south Deux Sèvres. This event is exactly half the distance of the Prudential Ride London Surrey 100 he is doing at the end of July and will be great practice for the three big climbs he will have to tackle in the Surrey hills. On Sunday we will take the tourist steam train from Tournon-sur-Rhône up to Lamastre in the hills and after a small detour down memory lane to St Julien Labrousse, we will start cycling the Dolce Via, a 50km cycle route that takes you from the Ardeche hills to the River Rhône via safe off-road pathways that is perfect for family cycling. We will then complete a section of the Via Rhôna, the cycle route along the Rhône from the Swiss Alps to the Mediterranean, to return to Tournon. For me at least, the cycling and the distances shouldn’t be too challenging and add in a spot of wine tasting, Côtes du Rhône has always been one of our favourites, and it is looking to be a rather nice few days away from home. For more information about the Ardéchoise event see here and for cycle routes in the Ardeche see Freewheeling France here. Thanks to the generosity of our family and friends we have already managed to raise £433 on our Prudential Ride London Surrey 100 Just Giving fundraising page. If you would like to give Adrian a virtual cheer on and give his training a morale boost you can make a donation by clicking on this link. We would love to raise £500 for Epilepsy Action. Many thanks. This post has been linked to the Dreaming of France blog link up at An Accidental Blog. See here for more posts including a cover reveal for a new novel set in France. 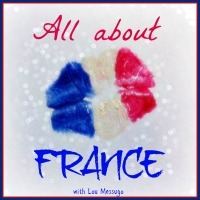 Welcome to ‘France et Moi’ where this week I am talking to author Marie Laval about what France means to her. Originally from a small village near Lyon in France, Marie has lived in the beautiful Rossendale Valley, Lancashire, England, for the past few years. She works full-time as a modern languages teacher and when she isn't busy looking after her family and preparing lessons, she loves dreaming up romantic stories. 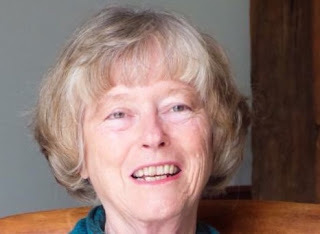 Her contemporary romantic suspense A Spell in Provence (see my review here), as well as her historical novels Angel Heart (review coming soon), the award-winning The Lion's Embrace and her Scottish trilogy DANCING FOR THE DEVIL are all published by Áccent Press. 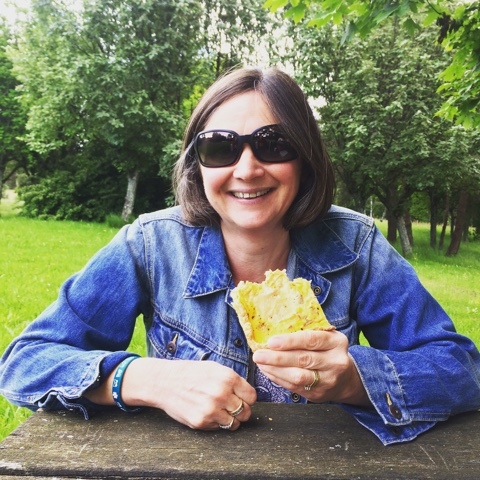 Marie: For me it has to be the long, leisurely lunches with friends and family, the heated discussions about politics or just about anything (! ), the incredible variety of landscapes...and the scents, but that's probably because scents always take me back to my childhood. There is nothing as evocative to me as smells of warm bread drifting out of the bakeries, of coffee and beer in cafés, or ripe fruit and fresh vegetables in the outdoor market. 2) As a French woman living in the UK I have to ask you about French women, what do you think makes you different to us and gives you that je ne sais quoi? Marie: If you knew me, Jacqui, you wouldn't ask that question! I don't think I have anything special that makes me different from English women - apart perhaps from my love of navy blue, red and white clothes, and my terrible French accent, which seems to be getting worse the older I get! Marie: I find inspiration in so many things, from memories of childhood holidays, to songs or novels, or again stories my mother used to tell me about growing up in Algeria... My family used to spend summer holidays in Provence, either in a tiny rental house in a pine wood near Hyères, or at my uncle's ramshackle house in Avignon. Memories of those sunny holidays inspired the setting of my romantic suspense A SPELL IN PROVENCE. My love for Lyon and its history inspired much of my debut historical romance ANGEL HEART, as did the fantastic story that Napoleon had stopped in my village on his way to Paris after he came back from his exile in Elba! 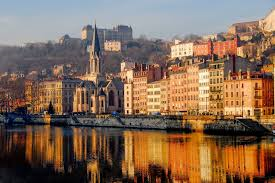 4) Lyon is somewhere I would love to visit one day, what are your top tips for a quick visit? Marie: Lyon is a wonderful city, and one that was declared World Heritage Site by Unesco a few years ago. I would start by a stroll down the two main pedestrian streets - Rue Victor Hugo and Rue de la République, with a walk around Place Bellecour, the largest pedestrian square in Europe. From there I would walk across the bridge over the river Saône and into the St George and St Jean districts, so atmospheric with their cobblestone streets and Renaissance buildings. I would take the 'funiculaire' right up to Fourvière and admire the panoramic view over the city. After visiting the basilica, I would walk back downhill towards St Jean, taking the time to look at secondhand book and gift shops. I would, of course, stop at a café for a drink and a crêpe, or if it was lunchtime, I would sample a 'quenelle' or some 'charcuterie' in a 'bouchon' (a small restaurant serving typical Lyonnaise cuisine). I would also go into a few 'traboules', which are passages silk weavers used to take to keep the rolls of fabric from inclement weather. I would then cross over the river into the 'Presqu'île' and the Place des Terreaux, before going up another hill - La Croix-Rousse, the old silk weavers district. One thing Lyon is famous for as well as its gastronomy, is its incredible wall art. Look at the buildings and you will be amazed. There is another, more leisurely way of seeing the town. You can take a river cruise down the Saône all the way to Ile Barbe, a lovely island North of Lyon. Marie: Do I really have to choose? I am a cheese addict. Marie: An expresso and a pain au chocolat, followed by a 'diabolo citron' (lemonade and lemon cordial). 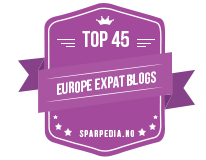 7) Every region in France has it’s own culinary speciality, do you have a favourite regional dish? Marie: That's a tough question, Jacqui, but I will choose a speciality from Lyon - and not frogs legs, although they are a must if you stop at one of the outdoor restaurants along the Saône. One of my favourite dishes ever are 'quenelles de brochet' in Nantua sauce - a dish made with pike, butter, milk and eggs, in a crayfish sauce. Simply delicious. 8) Do you think the French have a different attitude to food than the British and if so, is it a healthier one? Marie: Things have changed a lot in England since I first arrived. People now enjoy preparing food from scratch, trying 'foreign' recipes and taking their time over a meal. In France people take mealtimes very seriously, with three courses and freshly prepared food, although I suppose that, like everywhere else nowadays, more and more people are turning to frozen and convenience foods. Marie: It would have to be either Pomerol or Chateauneuf du Pape...and champagne, of course. Marie: I am shortly to release a historical short story set in the Camargue - SONS OF THE WIND - as part of an anthology of short stories called LETTERBOX LOVE STORIES which features American, Canadian and European romance authors. I am also editing a contemporary romance set in Scotland, PINK FOR HEART, and researching for another romantic suspense set in Paris. As usual, there aren't any hours in the day! Thank you for taking the time to answer some questions about France and you and I'm really looking forward to reading Sons of the Wind and the romantic suspense set in Paris. 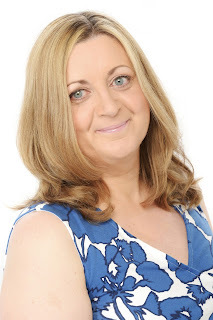 Marie: Thank you very much, Jacqui, for inviting me to your blog. France is a complicated being when it comes to administration and the beginning of 2016 marked a big change in the administrative regions. France has over 35,000 communes, each with it’s own Maire (Mayor), deputy Maires and councillors. Each commune is part of a Community of Communes, a group of communes who pool some of their resources together and ours (as it currently stands) is a group of 27 communes equalling 16,000 people. While small communes are being encouraged to join with their neighbouring communes, Community of Communes are in some areas being forced to join with other Community of Communes to ensure each one encompasses at least 20,000 inhabitants (although in rural areas where the population is low, an exception has been made). Then there are departments and above them, the regions, of which there were 22, but are now only 13. We are in the Deux Sèvres department, which was part of the Poitou-Charentes Région, until midnight on 31st December 2015. We are now part of the new Grande Région, which still has no official name, made up by amalgamating the Aquitaine, Limousin and Poitou-Charentes. This is just the start of many changes that will happen in France in the next five years, changes all brought about in the name of cost cutting. 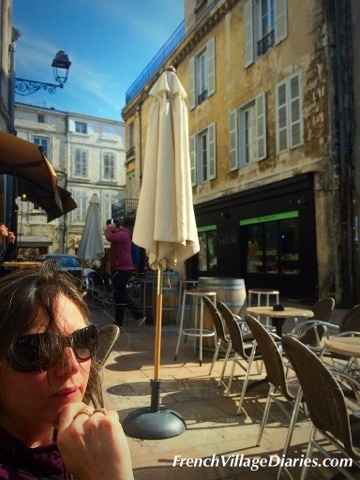 From a purely snobbish point of view I quite liked the idea of being part of Aquitaine, a wealthier region, further south, with more sunshine and sparkle than the Poitou-Charentes. Our new Grande Région, still referred to as ALPC (Aquitaine, Limousin, Poitou-Charentes), is now the biggest region in France, covering 84,000 km2, which is equivalent in size to Austria, and has 720km of coastline. The boundaries are almost identical to the borders of the ancient duchée of Aliénor d’Aquitaine, (Eleanor of Aquitaine) duchess of Aquitaine and Comtesse du Poitou in the 12th Century, who was also Queen consort of England from 1154 to 1189. With 5.8 million inhabitants it is the forth largest in France in terms of population and equivalent to the population on Denmark. It is also the largest region in France in terms of agriculture and holds second place in terms of most popular visited tourist sites in France. We are home to the Pyrenees and the Basque country, the Arcachon basin and Dune du Pilat, the cave art of Lascaux and the Dordogne valley, the vineyards of Bordeaux and Cognac and the Marias Poitevin national park, just to list a few of our specialities. We have it all, from mountains, coastline, history plus regional produce and we have been lucky enough to visit a lot of it by bike. We were sold this Grande Région on the basis that every region has a top man, with an office, staff, official car etc and therefore economies could be made by reducing expenses from the top down. Naively I believed. However, on reflection our weather has been more Limousin wet than Aquitaine sunny since the merger and while nothing much seems to have been taken away from the other two old regions, here in Poitou-Charentes we seem to have lost a lot and I’ve yet to see something change for us for the better. The first disappointing announcement was the cancellation of our Nuits Romanes summer concerts. For eleven years the Poitou-Charentes has celebrated it’s 800 Romanesque churches by holding outdoor music and dance performances during summer evenings. From the small villages of a few hundred inhabitants to the big cities like Angouleme and Poitiers, these concerts have been free and open to all and tourists, mainly French, have visited the area to follow these events as they move around the region. I’m sure the budget played a part in the decision to cancel, but also mentioned in the press was the fact that it was unfair for the Poitou-Charentes to put on this event when there was nothing similar in the Aquitaine or Limousin. It is now gone from us, forever. Last September when Ed went up to Lycée we were able to apply for a ‘cheque book’ that contained two 35€ cheques. These were handed to the parents association as full payment for a set of loaned second hand textbooks, funded by the Poitou-Charentes. In Aquitaine (a more wealthy region) a similar system existed, but whereas ours applied to all three years at Lycée, the Aquitaine system only ran for the first year. In the Limousin textbooks are free for everyone, for all three years. It seems that five months was apparently not long enough to find a scheme that worked for all of the ALPC, so Limousin will continue to be free as before, but Poitou-Charentes will be brought into line with the Aquitaine scheme. This means from September there will be no assistance with Lycée textbooks for two thirds of our lycée students, Ed included. It seems quite significant that the Poitou-Charentes appears last in the initials ALPC as so far we have seen plenty of cutbacks but no improvements and I’m just not convinced the other ex-regions have been so badly affected. I'm not a fan of change and especially changes that take away benefits without offering alternatives. We had a plan at the beginning of the week, but sometimes plans don’t always go to plan. 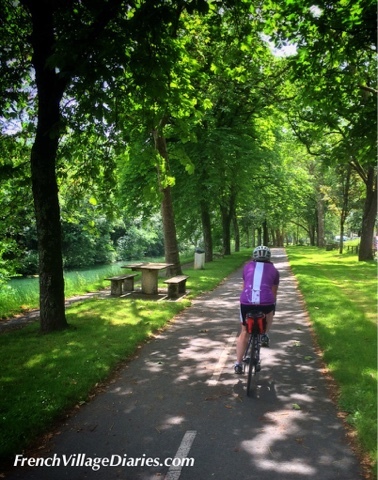 We were going to drop Ed at lycée in Melle at 7.30am on Monday and continue the drive west to Coulon in the Marais Poitevin. There we would swap the car for the bikes, pick up the Vélo Francette and follow it out of the Deux Sèvres into the Vendée, where we would stop for morning coffee at Damvix and then lunch in Marans, before arriving in La Rochelle in the Charente Maritime in the early afternoon. We cycled some of this route last September and our photos show blue skies, sunshine and a beer stop in Marans where we had to sit in the shade. We know the path is easy going, well marked and with riverside or canal views all the way. Last time we had to turn around at Marans and retrace our steps, hurrying back to sit in a parents meeting at Ed’s school, despite our hot and sweaty state, so we were looking forward to completing the route, cycling the 67kms into La Rochelle, enjoying an evening stroll and a meal by the harbour before staying the night at the Best Western Masqhotel. Monday morning dawned and it was so wet on the school run that most of the landscape had disappeared into the low-lying cloud and the edges of the roads were flooded. We could have rowed to La Rochelle, but as driving was unpleasant we decided cycling (even with wet weather gear) would be impossible. Adrian also had reservations about turning up in the foyer of a nicely decorated 4* hotel dripping wet and leaving puddles on their floor, but I reasoned if a hotel wants to welcome cycle tourists they need to welcome soggy ones as well as sweaty ones. However a quick phone call to the hotel reception confirmed that sunny La Rochelle was also wet, but they were happy to change our reservation to the Tuesday night. The forecast showed some improvement to the weather on Tuesday and Wednesday, so we spent a lazy day on Monday, watching the rain and drinking coffee to keep our spirits up. You have no idea how disappointed I was to open the bedroom shutters on Tuesday morning to see heavy rain falling again. We took our time getting ready and miraculously we actually began to see the sun and some shadows falling across the road on our drive to Coulon. However, the wind turbines we passed were turning with such force and vigour we knew we would be battling a head wind all the way to the coast. The weather so far this year seems to have been wild, wet and windy, calm and cloudy or on those rare days where the sun has appeared, it has been warm but windy too. 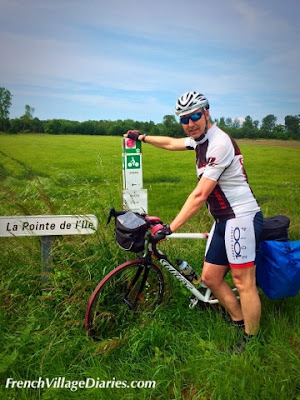 Cycling the Vélo Francette and following signs to The Ocean is exciting, even if we aren’t too far from home or doing the route for the first time. It was a shame we forgot that the marked route as you leave Damvix is pot holed, puddled and not nice to cycle along, while the opposite bank (which you join at the first weir) is flat and smooth-surfaced, but it is then a mostly straight route with the river to the right and holiday houses to the left all the way to Marans. There are some traditional stone houses with wisteria or climbing roses adding bright colour against the cream stone, others are small cottages with flowery gardens, but many are tiny wooden cabins, with names like Le Nid (the nest) and shady gardens with big barbeques ready to host large family get-togethers. Most were still tightly shuttered up, their season not yet started, although there were a few fishermen in residence, quietly watching the rather choppy waters of the wind-battered river. It may have been downhill all the way, but cycling into the wind gave a pretty good impression of cycling uphill. Just before Marans we cycled past market gardens with polytunnels of tomatoes and Vendéen strawberry fields full of ripe fruits. In Marans we had a picnic on the steps of the church where the wind made light work of moving the tin of paté from one side of the step to the other and we realised how chilly it was once we stopped peddling. After Marans the Vélo Francette follows the canal south to Dompierre-sur-Mer and I was worried that the cross winds would topple me into the canal, but thankfully a protective hedge kept the path sheltered and the wild elderflower ensured a pleasant and fragrant ride. 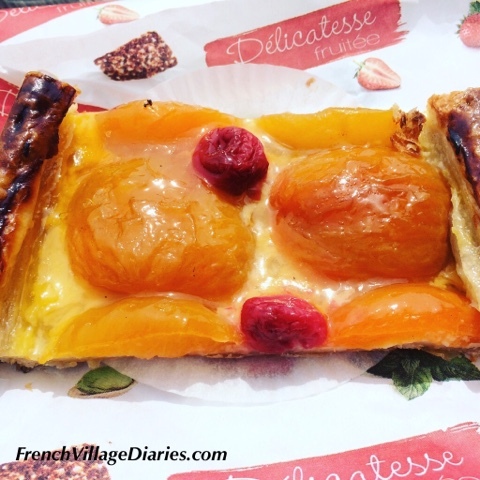 We have a bit of a holiday tradition, even on short breaks, to buy an afternoon patisserie and Dompierre provided a small square, set back from the road with a bar and a boulangerie. We were able to have a refreshing beer/Orangina with a slice of flan/fruit tarte before the final ten kilometres into La Rochelle. Finding the Masqhotel was easy as it is situated on the Vélo Francette route just as you arrive in La Rochelle. We were given access to the underground car park, where we found the bike storage that was safe, secure and dry and we were happy to leave our trusted steeds for the night. 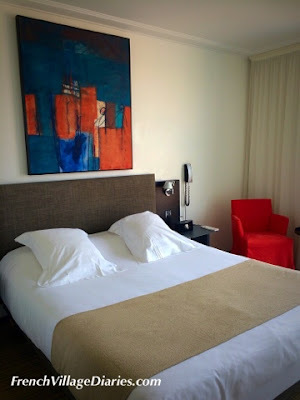 Our room was clean, bright and colourful with original artwork and finding a bath for our achy legs was a real luxury. 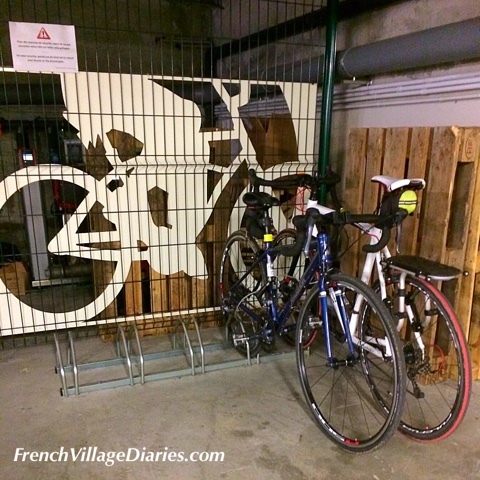 See here for my full hotel review for Freewheeling France. We quickly made ourselves at home and once freshened up set off to wander around the old port. Staying for the night was a real treat as La Rochelle is only an hour and a half away by car, so is normally a day trip location, or somewhere where I’m treated to a coffee after picking Adrian up from the airport. This time there was no need to rush, no need to think about the drive home, just plenty of time to browse the boutique shops, peruse the restaurant menus and enjoy a beer in the sun watching the assortment of bikes and cyclists go by. We even got treated to a lovely sunset over the harbour on our way back to the hotel after dinner; a three course meal on the quayside with a kir aperitif and wine that cost less than 50€. The comfy bed ensured I slept really well, despite Adrian’s fiddling with the ipod dock/alarm clock, which resulted in a timer going off at 1.55am. Honestly, give him gadget and he has to have a fiddle. 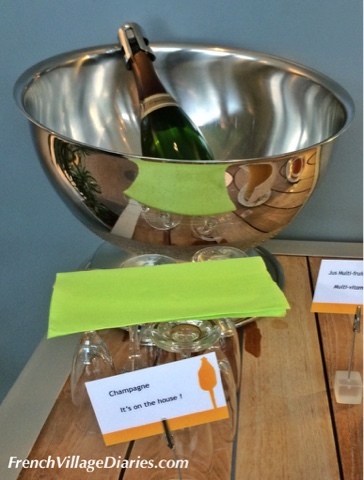 The breakfast was generous with hot and cold food and was the first place I’ve ever stayed to offer Champagne as standard at the breakfast buffet. They originally offered it as part of a St Valentine’s Day special, then decided it would be a great idea to keep it on the menu, I love places that have ideas like that! It was difficult to pack our panniers and leave such a lovely place behind and if you ever want somewhere special to stay in La Rochelle (and everyone should visit La Rochelle at least once) then I can recommend the Masqhotel, whether you arrive with your bikes or not. 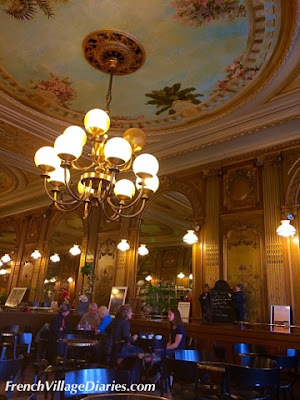 To cheer me up, Adrian promised me a morning coffee in my favourite café, Café de la Paix, with it’s painted ceilings, gilt mirrors and wood panelling. I never refuse an offer of coffee here and it was the perfect farewell to a lovely night in La Rochelle. 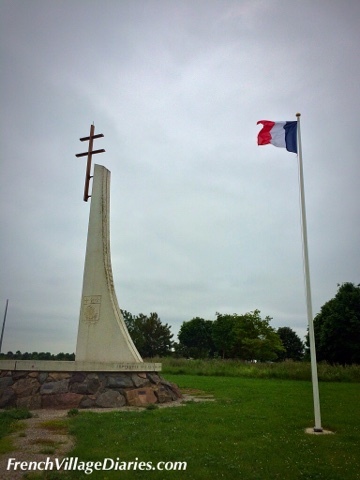 Our journey back to Coulon was a 60km ride on back roads, mainly through the villages of the Marais Poitevin but included a stop at the Resistance memorial in Saint Sauveur d’Aunis. We have driven past this memorial many times over the years as it is visible from the main dual carriageway between Niort and La Rochelle and it has been something we have wanted to learn more about. We now know it commemorates the ‘Poche de La Rochelle’ and the intense fighting that took place prior to the liberation of La Rochelle in 8th May 1945, almost nine months after the liberation of Paris. We might be home, but we are already looking forward to our next visit to La Rochelle as well as our next big cycling adventure. 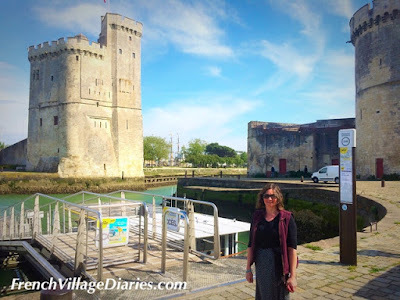 This post has been linked to the Lou Messugo All About France blog link up.